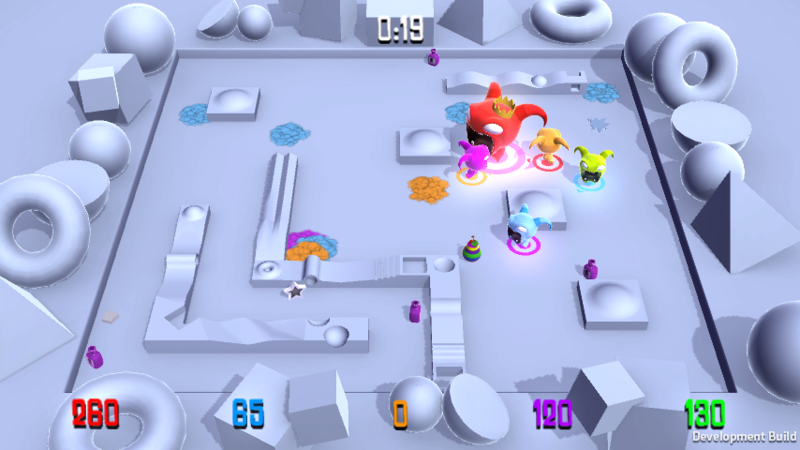 We're slowly starting to make Chompy Chomp Chomp Party look a little prettier. Things are a little different this time around, with everything being rendered in real time in the Unity engine we are looking at a lot of other games to make sure everything is a step up from the first Chompies. We've been getting inspiration from many places. Pocoyo has always been an inspiration, but now we can do so much more! We're looking a lot at Wind Waker HD, Super Mario 3D World and Mario Kart 8 for research.... or are we just playing them lots. We can't tell anymore! I've been working on Chompies in the shed on my own for some time now. I've been taking screenshots as I go, so that I can remember the progress that I've made. It's hard sometimes to realise. Sarah and I have blocked out a new Chompy Party logo as well. Animations! They really bring a game to life, and finally we've started bringing some character animations into Chompy Chomp Chomp Party. All of the assets for Chompy Party are being made in Maya LT. We have a standard HumanIK rig for the Chompy character, which controls the Chompy limbs (all two of them! ), body and head. These are then used to animate the locomotion; walking running, anything else the Chompy needs to do with their body. 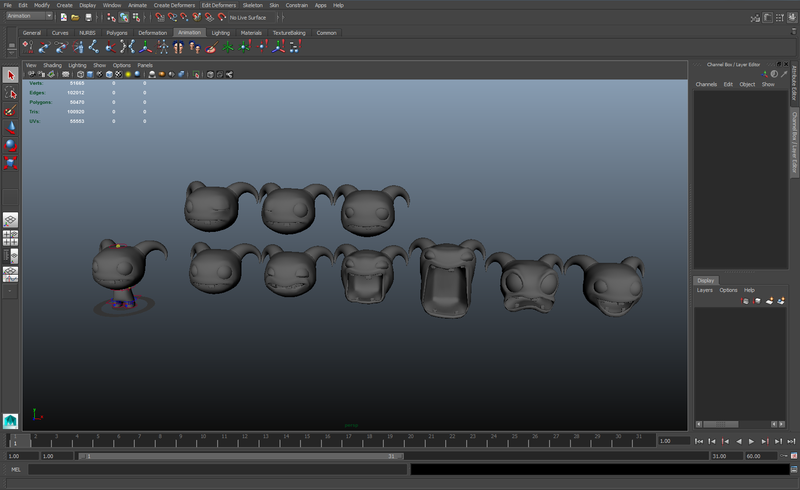 Then separate to that, we have blendshapes for the Chompy facial expressions. These are layered on top of the locomotion animations, so we can change the facial expressions of the Chompies, regardless of what action they're performing. Get close to another player and you'll try and chomp them, whether you're running or standing still. This keeps things nice and simple, from an art perspective at least. We decided to get Battle mode right before we worked on everything. It's got some big changes from the original. We've been play testing it at events with 9 people! We've also added a bunch of power ups. One we call the "Mega Moogy" which is a sandwich that makes your Chompy MASSIVE and you can eat everyone while they panic and run away. We've been wanting to add it for ages. There's going to be a few different power ups to mix it up a bit.